Acting President Yemi Osinbajo swearing in the new ministers. The Federal Executive Council (FEC) meeting holds on Wednesday at the Presidential Villa, Abuja. Vice President Yemi Osinbajo on Wednesday presided over the weekly Federal Executive Council (FEC) meeting at the Presidential Villa, Abuja. 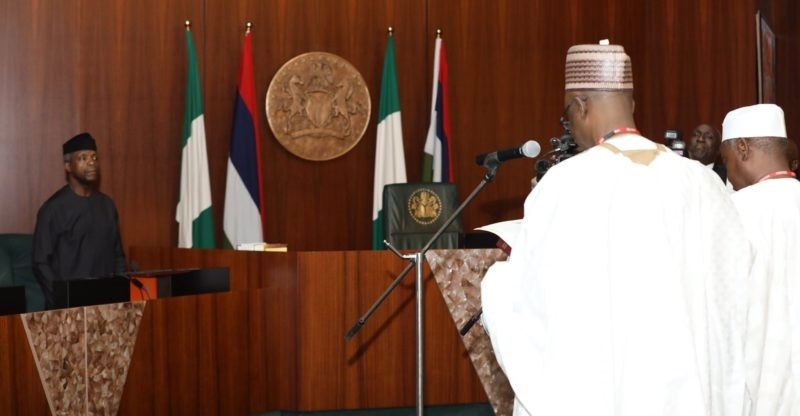 The FEC meeting which commenced at exactly 10:55 a.m. had in attendance Ministers of Information, Alhaji Lai Mohammed and Science and Technology, Mr Ogonnaya Onu. The Minister of Finance, Mrs Kemi Adeosun; and the Minister of State for Aviation, Hadi Sirika, among other ministers were also in attendance. Also in attendance were other cabinet members, including the Secretary to the Government of the Federation (SGF), Mr Boss Mustapha, Chief of Staff to the President Mallam Abba Kyari, among others.